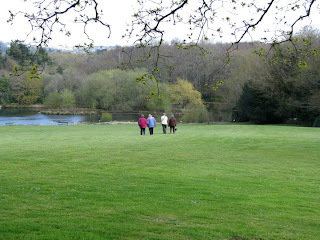 For our April outing to Pine Lodge, members were first taken to Trethorne Leisure Centre for their coffee break before reaching their destination in Cornwall. 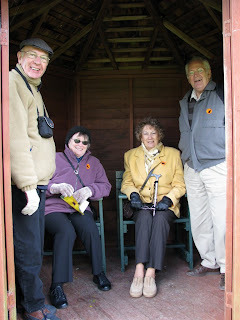 On arrival at Pine Lodge many were pleased to see the gardens bathed in sunshine. However, what was not expected was the strong and bitterly cold wind that blew across the less sheltered areas. Undaunted, and well wrapped up, members disappeared amongst the spring shrubs, plants and trees that adorned the edges of a series of paths that make Pine Lodge so interesting. The present owners purchased the land in 1976 and became fascinated with the world of plants. The collection of rare and unusual plants now stands at over 6000, all labelled. The 30 acres of land is divided into individual areas. 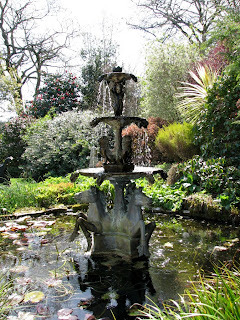 Noteworthy areas were the cottage garden, sunken garden, slave garden, Japanese garden and water garden. 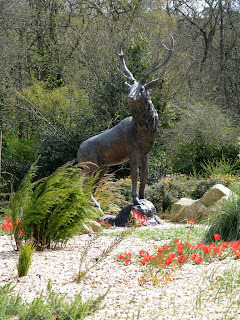 Since our last visit, an area of the parkland had been transformed into a winter garden, with freshly planted beds and a magnificent centre piece of a bronze stag standing on a raised rocky area, surrounded by vibrant red rock tulips. 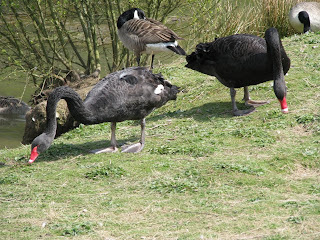 With the wind being so strong many members made for the shelter of the woods near the lake, and gazed at a variety of geese, ducks and two black swans preening themselves on the bank. Our day concluded with a return visit to Trethorne for an evening meal before travelling back to Tiverton.